This is a hard one to review. Here we have the story of Shin Dong-hyuk. 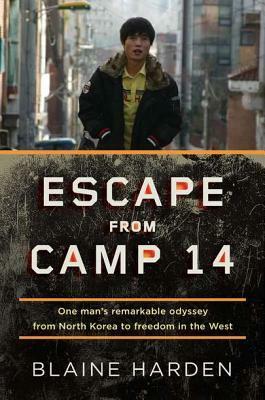 Born and raised in a North Korea political prison camp Shin eventually escapes. Very few are so fortunate…..I was torn for my feelings for Shin. Even Harden did not seem to like him very much. So many of the things Shin does are hard to accept….However, he was a product of his environment. I can’t imagine what myself or any other would do in his situation. It’s hard to believe that in this day and age that some people never have an opportunity to know what being treated as a human is like. We can’t possibly understand that to turn in someone else, knowing that it will most likely cause their death, means that we get to live another day. Yes, it is easy to *say* that we would rather die then turn in another just so we could continue on for a few more hours, days, or months….however, we have been treated with kindness at some point in time. We have laid down on a blanket of fresh grass and truly tasted freedom. But what if we have only known the inside of a prison camp such as those in North Korea. It’s hard to stop trying to figure out the why and to not pass judgement of Shin. If he were perhaps a better man would it have made any difference in the death of others? Would he be alive today to try to better his life? What lengths would you go to for a grain of rice? What makes us the person we are today? It’s hard to read this book and flat-out deny that environment does not play a major role in that. However, not everyone in the camps do what Shin did to survive. So where does that come from? What strikes me most is that it’s only when Shin decides to change how he deals with another human that he finally finds his freedom. I just wonder if Shin would change anything if he could go back in time….